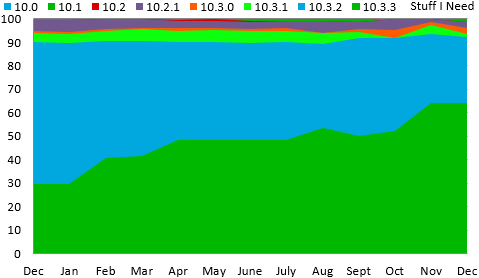 The final two months of 2017 saw a slight uptick in the use of OS 10.3.3 but things were mostly unchanged over the course of the past year as BlackBerry is no longer updating their OS. This data was collected by BlackBerry World for downloads of the free strategy game Pixelated and the free checklist app Stuff I Need. Data shown on the chart is from the beginning of December 2016 through the end of December 2017.